Frank Alvarado is currently employed by the United States Small Business Administration as the Senior Area Manager/ Veterans Affairs Officer for the Connecticut District Office working out of the Federal Courthouse Building in Bridgeport. In this role Frank is responsible for delivering the message of the SBA to stakeholders that have an interest in helping to improve Connecticut small businesses, as the Veterans Affairs Officer he works with the Veterans community in supporting their entrepreneurship aspirations and supporting Veteran owned businesses. 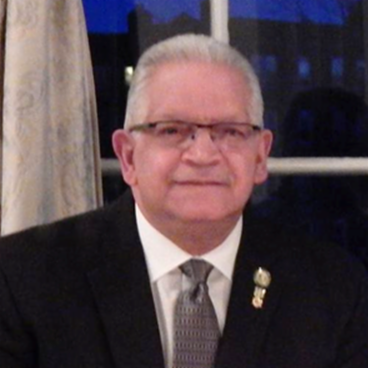 Prior to working for the SBA, Frank was employed by the Spanish American Merchants Association as the Director for the New Haven and Willimantic offices. Frank also has extensive experience in economic Development at the municipal level having worked for the City of New Haven for many years. Frank Alvarado is a retired Air Force Senior Non-Commissioner Officer having served in the Connecticut Air National Guard for over 20 years and also serving in the United States Army for three years, Frank is also a Veteran of the Vietnam War having served in country from November 1968 to July 1970. Frank holds an undergraduate degree from Albertus Magnus College and an MBA from the University of New Haven. In addition to his wife Carmen Alvarado CPA, Frank is the proud father of Frank Eric Alvarado, Amy Rebecca Alvarado and Dr. Camille Alvarado, Frank has 5 grandchildren and one great grandchild. Frank and Carmen reside in North Haven CT.
Frank’s community activities include current membership on several Boards of Directors and Commissions. Faxon Law Group New Haven Road Race. National Guard Association of Connecticut. Commissioner State of Connecticut Judicial Selection Commission.